your chance to get FREE tickets to the show on June 9th at the Stockton Arena!! This will be your chance to see Rey Mysterio’s return to the Stockton Arena! Kofi Kinston Vs. Daniel Bryan! AJ Styles Vs. Randy Orton! 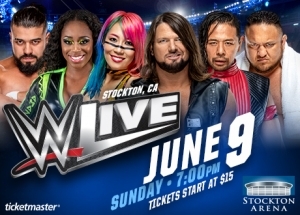 Plus, Charlotte Flair, Naomi, New Day, and many more of your favorite WWE superstars!